Well, I hope you all have a nice comfy pair of elastic-waist pants, because after today’s recipe you’re going to need them. This rich homemade candy comes courtesy of my friend Tracie. It was her grandmother’s *famous* recipe, sold at all the community events in her hometown. If you know a peanut butter lover, this one is a MUST. With a taste and texture reminiscent of the filling in a Reese’s Peanut Butter Cup, this fudge is rightfully famous. Grease an 8- or 9-inch square baking pan. Measure out the peanut butter and set aside. This entry was posted in Candy, Christmas, Dessert, Gift ideas, Holiday ideas. Bookmark the permalink. Aw, Christy, my grandmother would have been tickled pink to see her recipe on a web site! Thanks, and I hope everyone enjoys this as much as my family does. I put a plug on my site for YOUR site, thought you’d like to know. Also, I found a pic of my grandma selling the fudge, so I put that on too. You should explain in the directions that you dont need to boil on high for 4-5 minutes and then reduce heat and boil an additional 5 minutes. Which is how I read the recipie. Unfortunately, I got ROCKS instead of fudge. Michelle, If you follow the recipe exactly you will definitely get fudge, not rocks. While the fudge is cooking, you need to STIR IT CONSTANTLY. From your description, it sounds like you may have left the mixture boiling unattended. Even stepping away momentarily can have disastrous consequences. can you substitute the butter and peanutbutter for salted peanut butter and salted butter? Hi Priscilla! Yes, definitely. If you don’t have a sodium restriction, absolutely no reason not to use them interchangeably. Hope you enjoy it!! I find that if you leave it sitting on the counter to cool instead of putting it in the fridge you will not have the coarse fudge. I wanted to try a peanut butter fudge recipe, after a couple years making white fudge, chocolate fudge, m&m fudge, chocolate and white swirl fudge, but wanted to try peanut butter. Thanks this recipe was just as yummy as my regular fudge. Wonderful tip, Cathy!! Thank you so much!! I followed the directions exactly and I got a consistency equal to that of dirt. Yummy dirt, but I was hoping for fudge. Any suggestions? YIKES! So sorry Serena. I’m really at a loss – my fudge definitely was not dirt like! LOL Hope you enjoyed it anyway. Sounds like the sugar crystallized. Need to stir, stir and stir while it is boiling. I made it and it was AWESOME!!! This will be the only recipe I use now!!! I had to hide some ( for me) because my husband and two of my sons couldn’t quit eating it!!! LOL!!! Yes, RIP Grandma! Thank goodness she lives on in her fabulous recipe! Wishing you all the best, Tracy! Take care and thanks for taking the time to post! hello! I was just wondering about what the yield is for this recipe…? I’m making chocolate peanut butter layered fudge, yum!! Hi Marie, I’m sorry I don’t have a recipe for million dollar pie, but it sounds delicious! 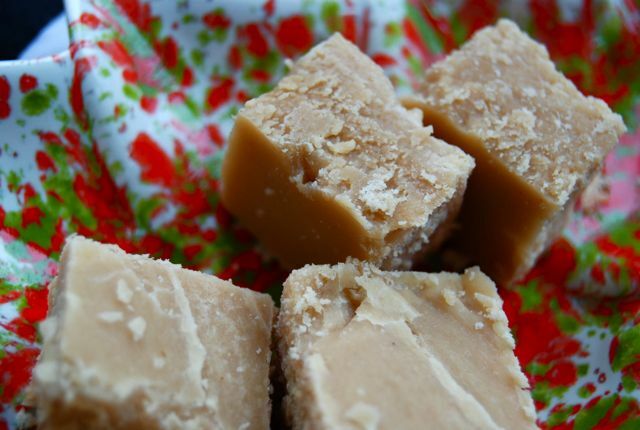 Your peanut butter fudge sounds just like my Grandma’s. I remember her recipe saying, add a tablespoon of butter the size of a walnut. I smile every time, I think about her recipe. I miss placed her recipe about 30 years ago, when we moved. I have been on the hunt for years, but no one in my family had her recipe, so when I came across yours, I wanted to try it right away. I don’t think 9pm is the best time to do it. So, Thank you very much! YAY! So glad you found the recipe, Bev! ENJOY! Thanks so much for sharing this recipe. It is wonderful. I did not have much luck the first time I made it, it came out like “dirt”. The second time took advice of the 2 minutes and 30 seconds after it came to a boil and turned out fantastic. Will be putting this in the cookbook for passing down to children. Yayyy! Glad to hear the 2nd try was successful, Peggy!! Wishing you a wonderful new year!